To work with database files, Veeam Explorer for Microsoft Exchange requires a special dynamic link library ese.dll, which is shipped with Microsoft Exchange. The ese.dll file must be of the same version as the Microsoft Exchange application with which your database files have been created. When restoring a VM that was backed up with application-aware image processing, the ese.dll file will be located automatically. Got to the Extensible Storage Engine tab. Click the link next to the Microsoft Exchange version and specify the path to the ese.dll file. 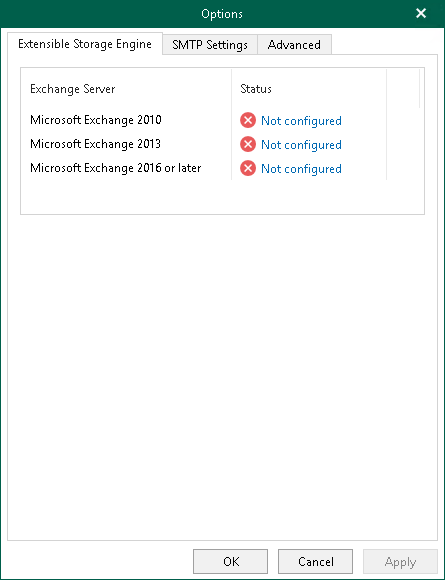 The file can be found on the Microsoft Exchange Server distribution CD at X:\Setup\ServerRoles\Common\ese.dll or, in the installation directory of the Microsoft Exchange server. To see estimated size of the Outlook database file, select the Show size estimation in status bar checkbox.